You don’t have to use predesigned filters in Project 2016: You can get creative and design your own filters. To define a new filter, you specify a field name, a test, and a value. The More Filters dialog box appears, as shown here. It lists all available filters — built-in and custom. The More Filters dialog box lists all available filters. 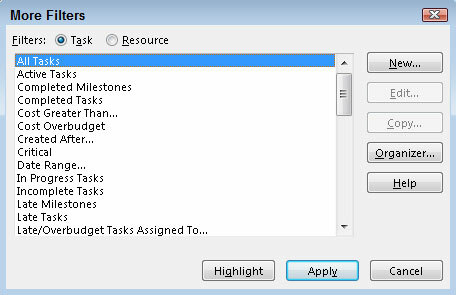 Select either the Task or Resource radio button to specify in which list of filters you want the new filter to be included. Click the New button. The Filter Definition dialog box appears. In the Name field, type a name for the filter. If you want the filter to be easily accessed in the drop-down lists, select the Show in Menu check box. Click the first line of the Field Name column and then click the down arrow that appears to display the list of choices, as shown here. Give the new filter a name that describes what it does. Click a field name to select it. Repeat Steps 5 and 6 for the Test and Value(s) columns. Test is a condition that must be met, such as Does Not Equal or Is Greater Than. Value(s) is either a value you enter, such as a specific date or cost, or a predetermined value, such as baseline cost. If you want to add another condition, choose And or Or from the And/Or column and then make choices for the next set of Field Name, Test, and Value(s) boxes. Note that you can cut and paste rows of settings you’ve made to rearrange them in the list, or use either the Copy Row or Delete Row button to perform those actions for filters with several lines of criteria. Click the Save button to save the new filter and then click Apply to apply the filter to your plan. Click the Organizer button in the More Filters dialog box to copy filters you’ve created from one Project file to another file or to make them available in all your files by copying the new filter into the Global.mpt.